The subcontinent of India lies in south Asia, between Pakistan, China and Nepal. 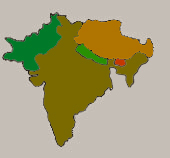 India is bounded on the north by Afghanistan, China, Nepal, and Bhutan; on the east by Bangladesh, Myanmar (formerly known as Burma), and the Bay of Bengal; on the south by the Palk Strait and the Gulf of Mannar (which separates it from Sri Lanka) and the Indian Ocean; and on the west by the Arabian Sea and Pakistan. 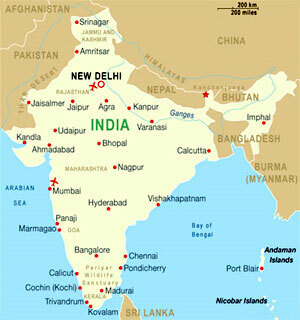 India is divided into 28 states (three of which are recently formed) and 7 Union Territories. New Delhi is the capital of India and one of its largest cities. India is the largest democracy in the world, the seventh largest country and the second most populous. India is a picture of diversity seen in her people, culture, colorful festivals, dress and costumes, religions, flora and fauna and varying landscapes. India is a enormous country and logistics are an important factor for travelers. Traveling in India is a haven of tourism delights, a civilization to tour through .Travel to India for its wealth of sights, cultural exuberance, diversity of terrain and in search of that special something, an extra punch that only India promises and delivers for unforgettable life time Journeys! India, long considered only a "cultural" destination, is in addition the ultimate "outdoor" destination as well, with wide ranging options for adventure travelers / trekkers and mountaineers. Traveling in India offers superb adventure package trip, trekking, mountaineering, wildlife safari adventures tour, walking and hiking holidays, cultural and religious tour, sightseeing tours for adventure traveler and enthusiastic. To the north it is bordered by the world's highest mountain chain, where foothill valleys cover the northernmost of the country's 26 states. Further south, plateaus, tropical rain forests and sandy deserts are bordered by palm fringed beaches . Side by side with the country's staggering topographical variations is its cultural diversity, the result of the coexistence of a number of religions as well as local tradition. Thus, the towering temples of south India, easily identifiable by their ornately sculptured surface, are associated with a great many crafts and performing arts of the region. From the smoky mangroves of the Sunderbans to the steaming Thar Desert, sizzling cities like Mumbai and Delhi to the scintillating villages of Khajuraho and Hampi, from the heights of the Himalayas to the deep blue waters around the Andamans, India is a travel haven – a tour package that frustrates and delights, as demanding as it is rewarding. For India traveling, there are several options by overland journey with its bordered country Nepal, Pakistan, Bhutan, Srilanka or by flight to India all over the world. Apex Nepal Adventure will arrange the all type of the overland transportation and flight ticket for India travelers for their safety adventure travel to India. Passport valid for at least 190 days required by all nationals British, American, Australian, Canadian and European citizens.Certain parts of the country have been designated protected or restricted areas that require special permits and in some cases prior government authorization. Intent to visit a specific restricted region should be indicated when applying for a visa and a permit will be granted to visit that region only. An additional form must be completed. Passengers are advised to check with the tourist board for up-to-date information before departure.